5 Bedroom House For Sale in West Sussex for Guide Price £725,000. 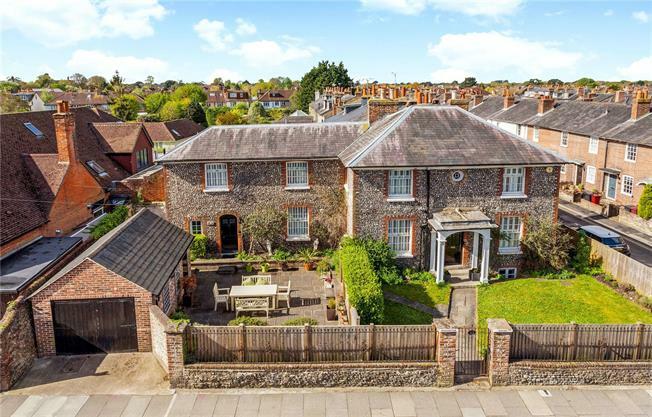 A charming Grade II listed, character five bedroom property offering 2,335 sqft/216.9sqm of accommodation, along with a courtyard and garage, set within a 700m walk of the City cross and just under a 500m walk from the renowned Chichester Festival Theatre. The property is spread over three floors and is well presented throughout with many of the rooms benefitting from having American style shutters. The accommodation consists of a converted cellar, which includes a spacious family/cinema room, utility area and fifth bedroom with underfloor heating. On the ground floor is a sitting room, dining room, cloakroom and kitchen/breakfast room, which provides access to the private courtyard and garage. Upstairs are four bedrooms and a family bathroom.The master bedroom also has an ensuite bathroom. Chichester provides a wide variety of shopping and leisure facilities including the renowned Festival Theatre. There is sailing close by at Bosham which form part of Chichester Harbour. Nearby Goodwood offers a golf and leisure club as well as hosting world famous horse racing and motor events. The newly formed South Downs National Park then provides a host of outdoor pursuits. The property occupies a corner plot and is situated on a conservation area. It has a front and side lawn area bordered by mature flower beds and enclosed by an attractive low level Sussex flint wall with an iron gate and flagstone pathway to the front door. There is also a delightful paved courtyard style garden providing low maintenance. Located off this space is a detached garage with eaves storage and barn style doors giving vehicle access out onto St. Pauls Road.